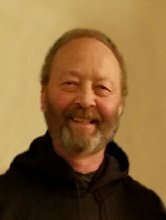 Obituary for Jeffrey L. Oldson | McCombs Funeral Home Inc.
Jeffrey L.”Oly” Oldson, 64, of Jackson, Missouri, formerly of Ankeny, Iowa, passed away Monday, January 28, 2019 at Saint Francis Medical Center in Cape Girardeau. He was born January 27, 1955, in Clarion, Iowa, to Roger and Bonna Eide Oldson. He was a 1973 graduate of Ankeny High School. He served honorably in the U.S. Navy from January 23, 1974 to May 22, 1976. Jeff and and Joy L. Leaf were married April 15, 1978 in Ankeny, Iowa and resided there many years. Jeff worked 13 years for Meredith in Des Moines, Iowa. They moved to Jackson in 1991 and Jeff worked 25 years at Mondi. He was looking forward to retiring this April. Jeff loved to spend time with his family. He also enjoyed woodworking, fishing, camping and traveling. Loving survivors include his wife of 41 years, Joy Oldson of Jackson; two children, Somer (Chris) Johnson and children Lilyon and Gryffin of Ankeny, Iowa; and Blake (Megan) Oldson and children Audrey and Gwen of Jackson; two brothers, Brian Oldson of Des Moines and Todd Oldson of Fishers, Indiana; and a niece, Victoria Oldson of Fishers. The memorial visitation will be from 6 to 8 p.m., Thursday, January 31, 2019, at Fruitland Church of Christ, 10387 State Hwy W, Jackson, MO 63755. The memorial service will be at 10:30 a.m., Friday, February 1, 2019, at the church, with Joe Chesser officiating. Military honors will be rendered by the Navy.